William Brittelle has drawn from classical music, punk rock, and electronica to produce music that is at once free-ranging and a thrill to experience. I can only blame God. From the opening moments of Genesis, we find the Creator of All Things fixed on categorization—dividing the light from the darkness, and assigning names to the newly created categories of night and day. Ever since, the impulse to categorize has seemed ingrained in humankind. So who could fault William Brittelle, the brilliant contemporary composer of resolutely uncategorizable music, for calling his work “post-genre”? A type of music designed specifically to defy categorization just has to fit into some category. Brittelle’s best argument for the expressive individuality he has promoted as both a composer and the co-founder of New Amsterdam Records came this February, when two of his most daring projects were presented in the same week: Spiritual America, a suite of songs performed by the combined forces of the New York–area Metropolis Ensemble, the Brooklyn Youth Chorus, and the Maryland-based indie duo Wye Oak; and Without Chasms, a multimedia work of images and electronica released digitally through a collaboration between Bandcamp and Brittelle’s label. What was most daring about them both, especially Spiritual America, was the utter fearlessness of their quirky beauty. In his two major works prior to these, the albums Television Landscape (2010) and Loving the Chambered Nautilus (2012), Brittelle showed a rare ability to employ imaginative combinations of acoustic instruments and electronics to make music that is not only technically innovative, but unabashedly emotive and, sometimes, terrific fun. With Spiritual America, he has ventured further still into the realms of the heart and the soul with as much imagination as ever. The composition is an eight-part suite of lyrical art songs through which Brittelle has attempted to connect two vastly different perspectives: on the one hand, his memories of growing up in a deeply religious community in the rural South; and on the other, his perspective as an “agnostic Buddhist” adult living in Brooklyn. “I felt like I had reached the point artistically where I need to figure out how to take down that wall and allow those two parts of myself to coexist,” he explained in an interview. For the New York premiere of Spiritual America, at Symphony Space in Manhattan last month, Brittelle filled the large stage with musicians and singers. 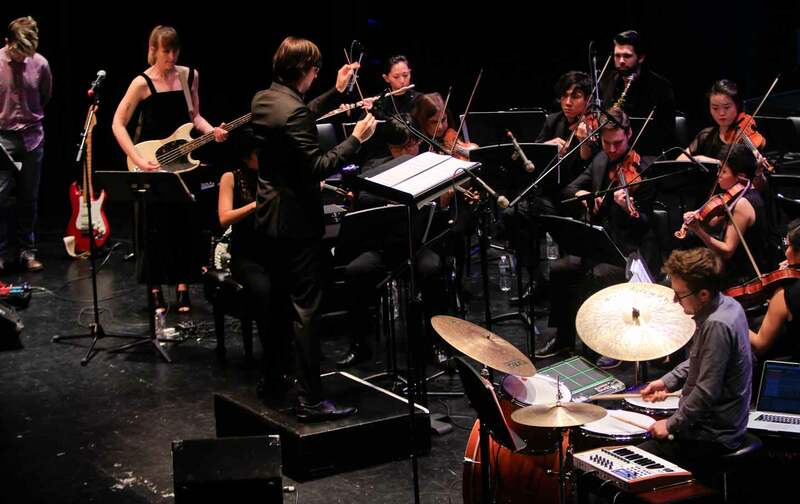 This performance included seven of the composition’s eight parts, along with several songs recorded by Wye Oak for their 2014 album Shriek, reimagined for orchestra and chorus. Yet the music never felt inflated or bombastic, the way “pops” orchestra performances of hit songs or rock standards almost always sound. Brittelle integrated the disparate elements of the assemblage into a rich, multiform, multicolored, twirling kaleidoscope of sound. At center stage, singing and playing electric guitar and bass, was Jenn Wasner, whose water-clear voice infused the work with a sense of innocence and wonder. “We tell lies to go to the mall…” Wasner sang on “Birds of Paradise,” the sixth song in the cycle. “The birds of paradise are porcelain / They don’t need batteries.” Simple, vaguely Appalachian melodies complemented the unaffected eloquence of the lyrics. Musically, the work was a celebration of the freedom that Brittelle has found in defying the strictures of category. The orchestra and chorus, augmented with some electronics, hummed and rang and swirled and pulsed in constantly shifting, unpredictable ways. Meanwhile, the prosaic eloquence of the words and folkish melodies grounded the piece. No one would need to read the program notes to feel how successfully Brittelle has reconciled the musical traditions of rural America with the tech-savvy worldliness of urban centers. Without Chasms may be less interesting—in fact, it’s more conventional as a piece of multimedia than Spiritual America is as a work of musical hybridism. Taken together, though, they’re an impressive testament to the fertility of William Brittelle’s imagination. And Spiritual America is something more: a sign that this precocious musical adventurer has now entered a new phase of creative maturity.